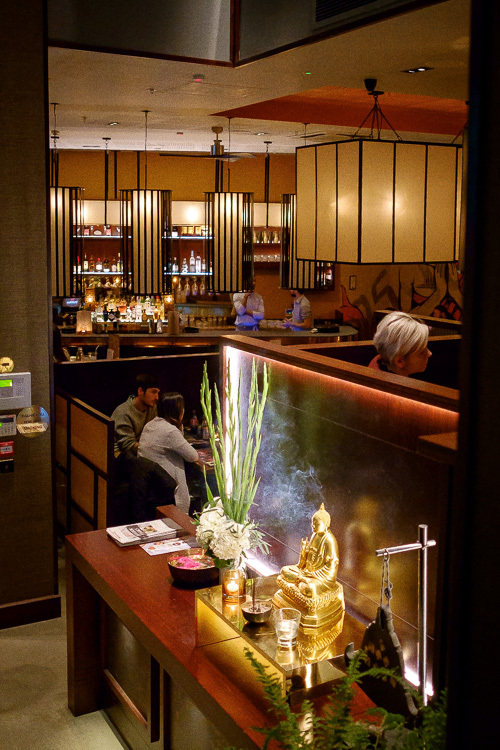 Sleek, stylish and smelling gorgeously of lemongrass incense, Busaba Manchester welcomes you with warmth as you cross the threshold. With rich rosy wood decor, muted lighting and huge dramatic arty murals plastered across walls, the place oozes atmosphere and grand designs. We were lucky enough to get a table upstairs next to the window, so we could survey from on high the nightlife of Manchester as it passed us by. 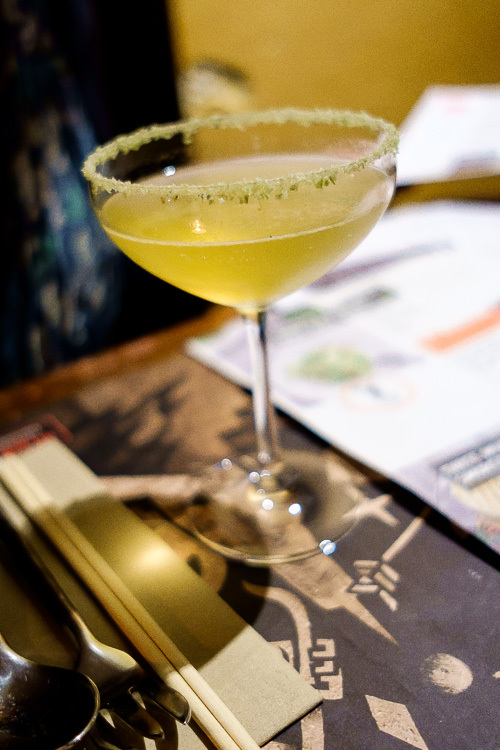 Joining in the fun, we ordered Thai Martinis, a twist containing gin, basil grape juice, lemongrass and elderflower cordial, served in a basil sugar rimmed glass. All we can say is: Moreish! 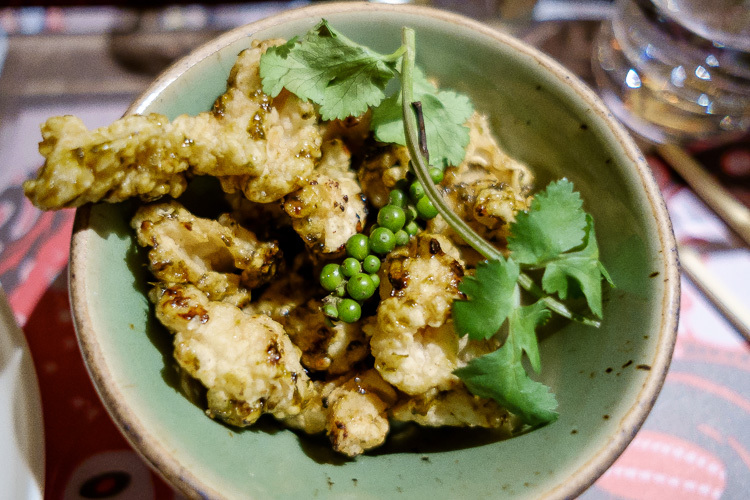 For starters, we opted for Thai Calamari with ginger and green peppercorn – the sweet, salty glaze clinging to the squid was good, but just a couple of pieces were almost verging on the rubbery. Still, it was an original, unusual take on the usual deep-fried stuff we all know and love, so I’d order it again. 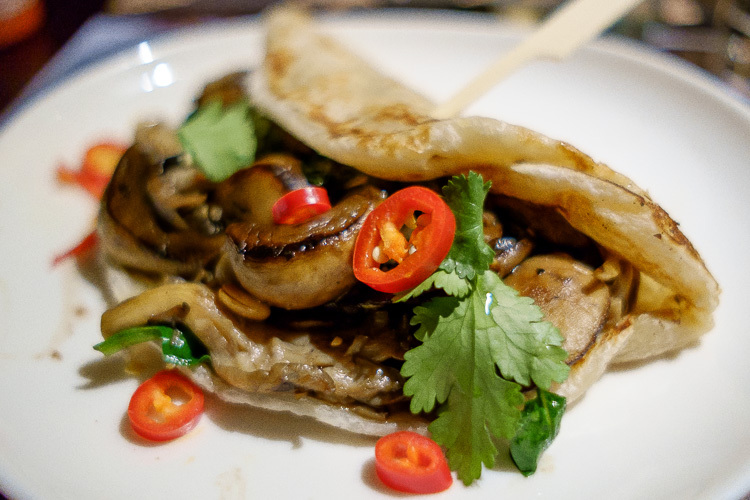 We also tried Mushrooms with spinach and chillies in a Thai Roti from the specials menu. The bread was fresh, authentic, warm and tasty with a good chewy but light texture and the mushrooms were seasoned perfectly. I fancied a prawn dish for my main and was almost going to opt for the Chilli Prawn Stir-Fry but decided against it as it had a ‘three chilli’ heat rating and we’d heard that the dishes were authentically seasoned. So instead I went for the tamer ‘one chilli’ heat rated Bangkok King Prawn, a dry yellow curry with garlic, chilli, spring onion, ginger and coriander. 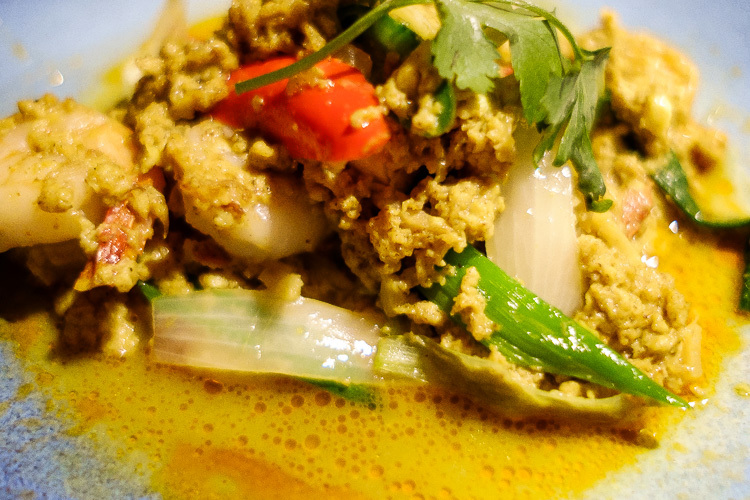 Whilst it was super-tasty with plenty of prawns and a good soupy sauce, I ended up tiring of the lack of clean, sharp spice – and I wish I’d opted for the more fiery dish. My bad for playing it safe – but perfect for people who don’t like to get their tongues burned. My other half thought outside of the box and chose an unusual dish of Wild Black Pepper Venison. The meat was perfectly cooked in tender strips and the addition of picked garlic to the sauce turned the traditional Yorkshire meat into a Thai sensation, with just the right amount of heat to keep things spicy. A perfectly salty side dish of Chinese Broccoli with mushrooms and lashings of garlic pieces (I love!) added lots of interest. For dessert I tried a Salted Caramel Chocolate Slice. The creamy top was spot-on but the cake below a little dry and crumbly. But my other half hailed his Sticky Black Rice Pudding an absolute triumph. Deliciously sweet in a light creamy sauce with a little bite from the black rice, it came served warm with a little fresh mango and some coconut slivers. 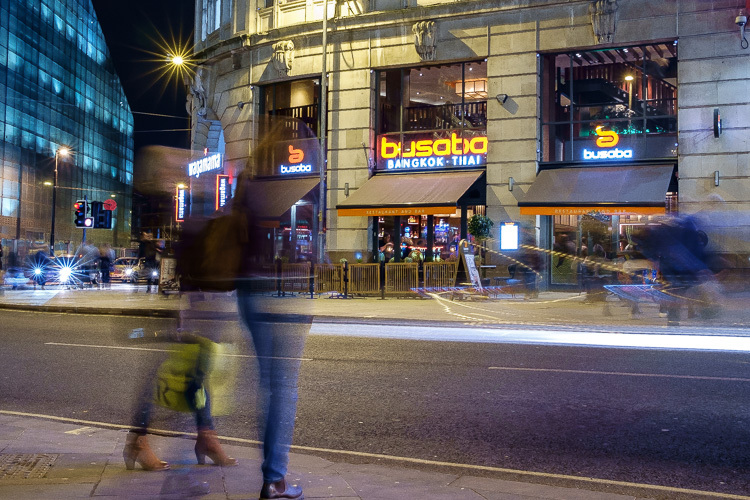 Busaba has a great, relaxing and chilled vibe about it and we’d come back for more.